Hours: Monday through Saturday from 8:00 a.m. to 5:00 p.m.
Recycling/buyback facility accepts aluminum scrap, aluminum/steel/tin cans, clean aluminum foil, cardboard, paper, glass containers, magazines/junk mail, newspapers, and hard plastics numbers 1 through 7. 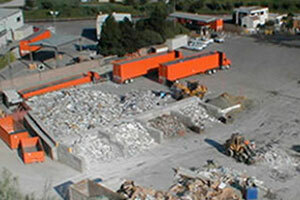 Also accepted are scrap metals such as brass and bronze, cast iron, copper, steel, tin, and untreated wood and pallets. Accepts mattresses and box springs, free of charge, up to five sets per day. Accepts green waste (including Christmas trees) for recycling. A free mulch pile is available to the public during normal business hours. Delivery of unscreened mulch is available by contacting Waste Management at 242-7936. Cost for delivery varies based upon destination. In addition, this facility accepts antifreeze, household and auto batteries, motor oil (including agricultural oil), oil filters, latex and oil-based paint (up to five gallons per visit, up to 20 gallons per day), and various types of electronics and small appliances for recycling. Please note that household batteries are accepted for free from residents in the unincorporated areas and the city of Solvang, whereas a fee is charged for residents in other areas.